Tonight Meg had an orchestra concert. She is doing so well with learning to play and perform. She did a great job tonight. 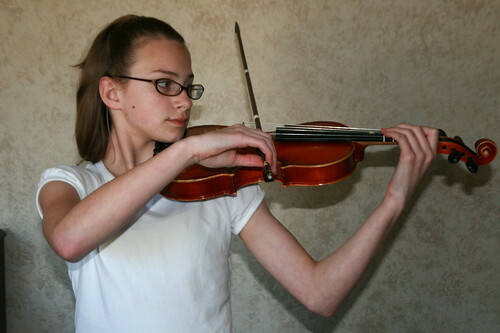 She is looking forward to taking orchestra again next year. The concert ended with the high school orchestra's performance. They were GOOD. It was good way to inspire the younger players. This afternoon we made an offer on a house!!! It's exciting and a little scary. We've been so busy we've hardly thought about it. We should hear back by noon Thursday. Wow, look at that amazing bowhand! I had lots of string playing sisters, so I can tell she's been trained well! Where is the house you made an offer on? That's so exciting!